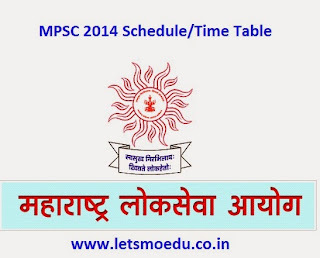 Maharashtra Public Service Commission or MPSC declared the official time table notification for upcoming year 2014: Here you can check out the MPSC 2014 Schedule Time Table, Exam Date's different examination wise. MPSC 2014 includes Engineering services includes Mechanical, Electrical, Civil, Sales Tax Inspector, Police Sub Inspector, Clerk Typist, Forest Services, Agriculture Services, Group A or Group B recruitment. In the month of November 2014, Maharashtra Government declared the official notification regarding the "MPSC 2014 Examination Time Table" on www.mpsc.gov.in . We are also providing you official pdf notification at the end of this post. These dates are tentative, you need to keep updated to check when the official notification, advertisement will come because sometime exam schedule will change because of some technical problem, dates overlapping with other examination (University Examination, Engineering Exams.. etc). From last few years MPSC are going to invited only online application forms, there is no offline forms. You need to fill your MPSC 2014 Online Application Form for applying any of following examination. Why this tentative dates are published by Service Commission, because If students know the tentative dates then they will prepare for specific examination and preparing with their as per decided study schedule. For latest updates regarding the MPSC 2014 you must log on to Let's More Education in the PSC section >> MPSC or directly search in box and keep you updated with other entrance Examination with our Facebook Page. If you are having any query, doubt, question regarding the MPSC 2014 Examination then you leave your comments we will answer your question..
Keep visiting and find latest updates of Entrance Examination, Government Jobs, Career Guidance, Career Tips.. I need the MPSC STI 2014 Syllabus. Can you please give me.? is STI prelim answer key out yet? if yes, can you share the link. Hi, I'm a BE(Electrical). I need completely basic details about MPSC exams. 2) Maharashtra Engineering Services (Electrical ) Group A Examination 2014. 3) Maharashtra Engineering Services (Electrical ) Group B Examination 2014. Can you please also tell me what is the difference between Group A and Group B.
I rather need an overview about the above exams, time table, schedule, pay scale, syllabus. sir i want to attend mpsc sti exam , now i am a second year engg student i just want to give this exam because i want to experience it only am i able to give this exam ?